2nd oval: 10 double, join to the same purl as last--namely, the one connecting the first and second ovals of the piece already worked, 10 double, draw up. Repeat, joining the two next ovals to the purl which connects the two next in the piece already worked, and so on. This lace is rendered stronger by the crochet rows of scallops and treble stitch round the edge. Begin with the tatting as follows: Make a circle of 8 double, 7 purl divided by 2 double, 8 double. This circle is repeated at a distance of about three-fourths of an inch, only instead of the 1st purl each following circle must be fastened on to the last purl of the preceding circle. 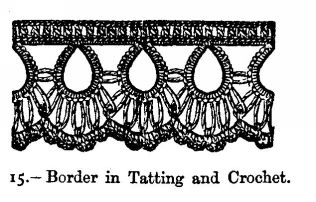 Then take some crochet cotton, which must be finer than the cotton used for tatting, and work a row of double stitches over the thread which joins the circles. 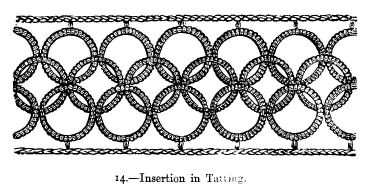 The number of stitches depends on the length and size of the cotton; work double stitches round the circles at the place where both ends meet. The outer row consists of treble stitches, which are worked with 1 chain stitch between, missing 1 stitch under each chain. The scallops consist of the two following rows:--1 double, with which the last and first purl of 2 circles are joined, 4 chain; in each of the other purl, 1 double, 4 chain, between 2 double stitches.